Pentagram’s Angus Hyland and Fernando Gutiérrez watched their beloved 1960s, 1970s and 1980s Cuban film posters auctioned a few weeks back. Pentagram’s Angus Hyland and Fernando GutiÃ©rrez watched their beloved 1960s, 1970s and 1980s Cuban film posters auctioned a few weeks back. But £1689 was raised for Havana’s Centro Desarollo de las Artes Visuales, much helped by a hapless auction-goer bidding against herself. 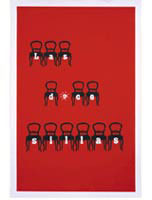 An ex-Pentagram employee paid £130 for Las Doce Sillas, by Anon, egged on by the superslick auctioneer – ‘Round it up, easy for accounting’ and ‘£42 sounds better’.